Religion in Chile is a very interesting topic due to the country’s rich history and current, modern evolution. Traditionally, Chile is a very conservative culture. 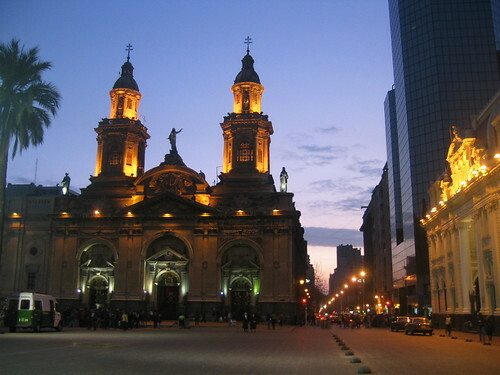 The Roman Catholic Church was the official church of Chile for many years until the late 19th century. Chile now enjoys freedom of religion and a clear separation of church and state. However, even this separation is blurry as the Catholic church still has great influence throughout the country. Divorce, for example, was only legalized as recently as 2004. About 70 percent of Chileans are Catholic. Most Chileans are born into Catholic families and follow the traditions of their fathers. Most towns and cities in Chile have a large Catholic church on the main plaza or along the main road through town. You will find statues and shrines to the Virgin Mary in people’s houses, along the roadside, and prominently displayed on the tops of hills (like the San Cristobol hill in downtown Santiago). Pope John Paul II visited Chile in 1987 during the iron-fisted rule of Augusto Pinochet. Chileans still talk about that visit like it was yesterday because it had such a big impact on softening Pinochet’s rule. Saint Alberto Hurtado, commonly known as Padre Hurtado, is Chile’s most famous saint. He spent his life helping, housing, and caring for homeless children. Padre Hurtado’s legacy lives on through the large and successful charity he formed called the Hogar de Cristo, or House of Christ. Evangelical church members, or evangelicos as they are known in Chile, are the most lively group of churchgoers I’ve ever seen. As you walk through neighborhoods, you can hear their music and celebrations lofting through the air. Instrument-playing members will often take to the street to share messages and music with everyone they pass. The Church of Jesus Christ of Latter-day Saints (La Iglesia de Jesucristo de los Santos de los Ultimos Días) whose members are often called mormones, is a quickly growing Christian religion in Chile. You’ll find churches throughout the country and often within walking distance of wherever you are in densely populated Santiago. While the majority of Chileans are Christians, there is a diverse, yet small, group of Jews, Muslims, and other religions in Chile. Chile’s favorite entertainer, Don Francisco, is Jewish. About 8 percent of Chileans are self-proclaimed agnostics. Chile’s first female president, Michelle Bachelet, described herself as agnostic. Regardless of your religious preference, you’ll find a place to worship in Chile. Additionally, you can enjoy the rich history and architecture of the colonial-era Catholic cathedrals that are throughout the country.